“You have been accepted!” Those were the magic words I was hoping to hear when I sent in my application for the Spring 2016 Citizens’ Academy. Offered by the San Diego County District Attorney’s Office and the San Diego County Sheriff’s Department, the academy provides an exciting behind-the-scenes look at the criminal justice system. I now have a front row seat as experts discuss high-profile homicides, gang prosecutions, human trafficking, dangerous drug trends, law enforcement use of force policy and officer involved shootings, elder abuse, economic crimes, the role of the CATCH team (Computer and Technology Crime High-Tech Response Team), insurance fraud, and victim services. A tour of the San Diego Medical Examiner’s Office and special access to the Sheriff’s weapon simulator are additional highlights. Who could ask for more? The academy was off to a blazing start on March 24, 2016 when District Attorney Bonnie Dumanis and Sheriff William Gore gave enthusiastic opening greetings to the 78 participants. Chief Deputy District Attorneys David Hendren and David Greenberg then gave in-depth presentations about the criminal justice system and the District Attorney’s Office. What a night! 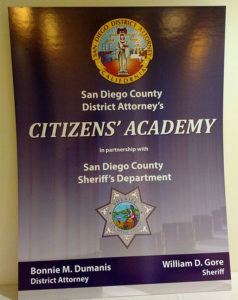 If you are interested in applying for the next academy, please go to: www.sdcda.org/office/citizensacademy. Any member of the public may apply to this competitive program, but must pass a criminal background check and commit to the ten-week program one evening per week.